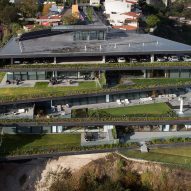 Black porcelain walls appear to fold up and around the huge windows and gardens of this luxury housing block, which Sordo Madaleno Arquitectos has staggered down a hill in Mexico City. Sordo Madaleno Arquitectos' five-unit Alcázar de Toledo apartment block descends in four levels. The three glass-fronted lower floors – occupied by the residences and amenities – are designed to gradually stagger out further than the floor above, mirroring the slope of the site. 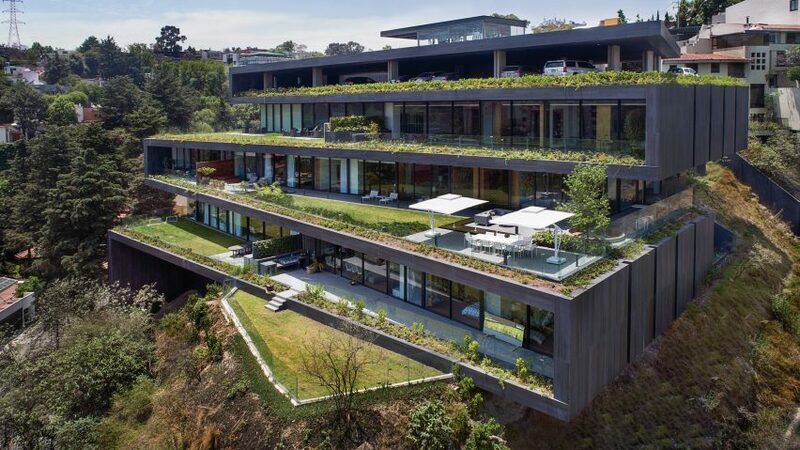 "The site has a very rugged topography so it was decided to integrate as far as possible the architecture to these natural formations," said Sordo Madaleno in a project statement, "with the aim of respecting the environment and exploiting the extraordinary panoramic views of the city that can be seen between the vegetation." 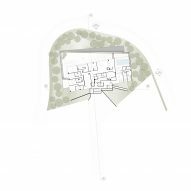 Triangle-shaped grassy terraces run along the front and are set in an alternating layout to create a zigzag shape in plan view. "The architectural concept is based on a linear element, which folds itself over the topography in a right-angled zigzag shape," the firm continued. 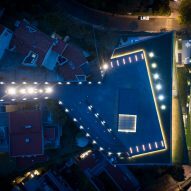 "This resulting piece of four levels, as it adapts to the ground, is transformed into a structure element – like a wall or slab – or an open plaza or terrace," it added. Black porcelain tiles cover the portions of wall between each level, as well as the sides of the building. 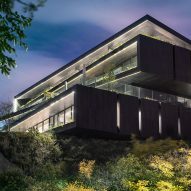 The firm chose the material for its hard-wearing and lightweight properties, and the dark finish also defines a continuous outline in contrast to the large expanses of glazing. The building is accessed from the top level, along a tree-lined road that leads from the street onto the rooftop. 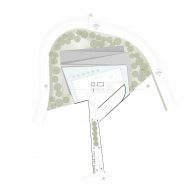 A pool of water wraps around the outer perimeter of the roof, acting as a barrier to the drop beyond, while a glazed box in the centre houses a reception area that provides access to the levels underneath. 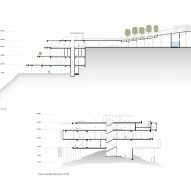 The residential car park occupies the storey below, and is accessed from the roof via a five-metre-long ramp. Two apartments, each measuring 500 square metres, are equally split across the next floor. Both have an open-plan living and dining room, and master bedroom set to the front, with glass doors opening onto the outdoor wooden decks running along the gardens. As well as providing residents with shaded outdoor space, the gardens are also used to capture rainwater, which is then stored, treated and used for irrigation. Two bedrooms with en-suite bathrooms, and a kitchen occupy the rear of each of these apartments. Amenities are located on the level below this, including a pool, spa and gymnasium, along with the third apartment. This home is slightly larger than the others, boasting an additional bedroom, a library and a wine cellar. Residences four and five make up the lowest storey. While five has the same layout as the first two, four has just two bedrooms to make room for a wine cellar, children's playroom and a study, suiting the needs of a different resident. 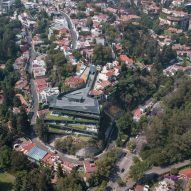 Sordo Madaleno Arquitectos was founded in 1973 by the late Juan Sordo Madaleno, who is regarded as one of Mexico's most important architects, and who worked with other influential figures including Luis Barragán and Ricardo Legorreta. Madaleno's son Javier Sordo Madaleno Bringas has run the family firm since 1982. 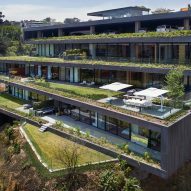 Javier Sordo Madaleno de Haro and Fernando Sordo Madaleno de Haro, who make up the family's third generation of architects, are also principals. Among the studio's most recent projects is a tower in Guadalajara comprising stacked and offset boxes, and a Massimo Dutti store. The firm also revealed plans for an elliptical latticed skyscraper in Mexican city's downtown area earlier this year.